In the kitchen of Michael’s Santa Monica, executive chef John-Carlos Kuramoto is turning out some amazing cultural mash-ups right now. 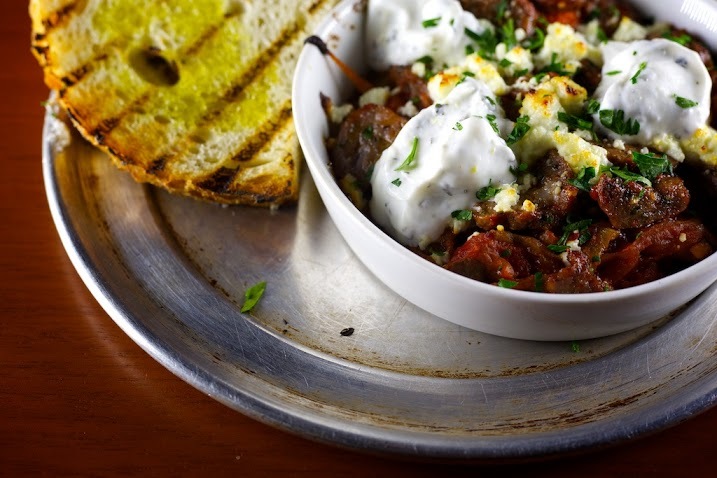 Take this small plate, which combines the superbly spiced Moroccan-style lamb sausage known as merguez; the Italian ragout of peppers, tomatoes, onions, garlic, and herbs called peperonata; fresh goat cheese; and a dollop of creamy, tangy Greek yogurt. We serve this insanely delicious small plate with crusty grilled bread, but we can’t stop you from just spooning it up straight from the bowl. Order one for your the table to share. But be aware that you may well want to order seconds.